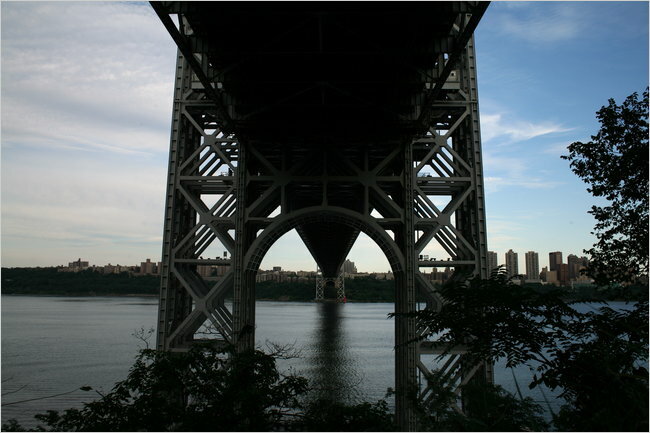 Mr. Clementi, a Rutgers University freshman, is thought to have jumped off the George Washington Bridge. That night, the authorities say, the Rutgers University student who sent the message used a camera in his dormitory room to stream the roommate's intimate encounter live on the Internet. And three days later, the roommate who had been surreptitiously broadcast - Tyler Clementi, an 18-year-old freshman and an accomplished violinist - jumped from the George Washington Bridge into the Hudson River in an apparent suicide. Those who knew Mr. Clementi - on the Rutgers campus in Piscataway, N.J., at his North Jersey high school and in a community orchestra - were anguished by the circumstances surrounding his death, describing him as an intensely devoted musician who was sweet and shy. The Middlesex County prosecutor's office said Mr. Clementi's roommate, Dharun Ravi, 18, of Plainsboro, N.J., and another classmate, Molly Wei, 18, of Princeton Junction, N.J., had each been charged with two counts of invasion of privacy for using 'the camera to view and transmit a live image"� of Mr. Clementi. The most serious charges carry a maximum sentence of five years. Steven Goldstein, chairman of the gay rights group Garden State Equality, said Wednesday that he considered the death a hate crime. "We are sickened that anyone in our society, such as the students allegedly responsible for making the surreptitious video, might consider destroying others' lives as a sport,"� he said in a statement. It is unclear what Mr. Clementi's sexual orientation was; classmates say he mostly kept to himself. Danielle Birnbohm, a freshman who lived across the hall from him in Davidson Hall, said that when a counselor asked how many students had known Mr. Clementi, only 3 students out of 50 raised their hands. But Mr. Clementi displayed a favorite quotation on his Facebook page, from the song 'I'll Never Fall in Love Again"�: "What do you get when you kiss a guy? You get enough germs to catch pneumonia. "� And his roommate's Twitter message makes plain that Mr. Ravi believed that Mr. Clementi was gay. Ms. Birnbohm said Mr. Ravi had said the initial broadcast was an accident - that he viewed the encounter after dialing his own computer from another room in the dorm. It was not immediately known how or when Mr. Clementi learned what his roommate had done. But Ms. Birnbohm said the episode quickly became the subject of gossip in the dormitory. Mr. Clementi's family issued a statement on Wednesday confirming the suicide and pledging cooperation with the criminal investigation. 'Tyler was a fine young man, and a distinguished musician,"� the statement read. "The family is heartbroken beyond words." The Star-Ledger of Newark reported that Mr. Clementi posted a note on his Facebook page the day of his death: "Jumping off the gw bridge sorry. "� Friends and strangers have turned the page into a memorial. Witnesses told the police they saw a man jump off the bridge just before 9 p.m. on Sept. 22, said Paul J. Browne, the New York Police Department's chief spokesman. Officers discovered a wallet there with Mr. Clementi's identification, Mr. Browne said. The timing of the news was almost uncanny, coinciding with the start of "Project Civility"� at Rutgers, the state university of New Jersey. Long in the planning, the campaign will involve panel discussions, lectures, workshops and other events to raise awareness about the importance of respect, compassion and courtesy in everyday interactions. Mr. Ravi was freed on $25,000 bail, and Ms. Wei was released on her own recognizance. The lawyer for Mr. Ravi, Steven D. Altman, declined to comment on the accusations. A phone message left at the offices of Ms. Wei's lawyer was not returned. Reporting was contributed by Al Baker, Barbara Gray, Nate Schweber and Tim Stelloh. Copyright 2010 The New York Times Company. Reprinted from The New York Times, National, of Thursday, September 30, 2010.